From 11 to 15 August, the European Foundation for Support of Culture, together with the China Economy Exchange Association, have organised the Shanghai International Young Artists Piano Festival and Competition 2018. The festival events included a piano competition and a series of concerts with participation of classical music stars, such as the winner of the Montreal International Musical Competition, pianist Nareh Arghamanyan. Zhu Yafen, professor at the Shenyang Conservatory of Music, chaired the jury. Zhe Tang, piano professor at the Shanghai Conservatory of Music, was the Artistic Director of the festival. 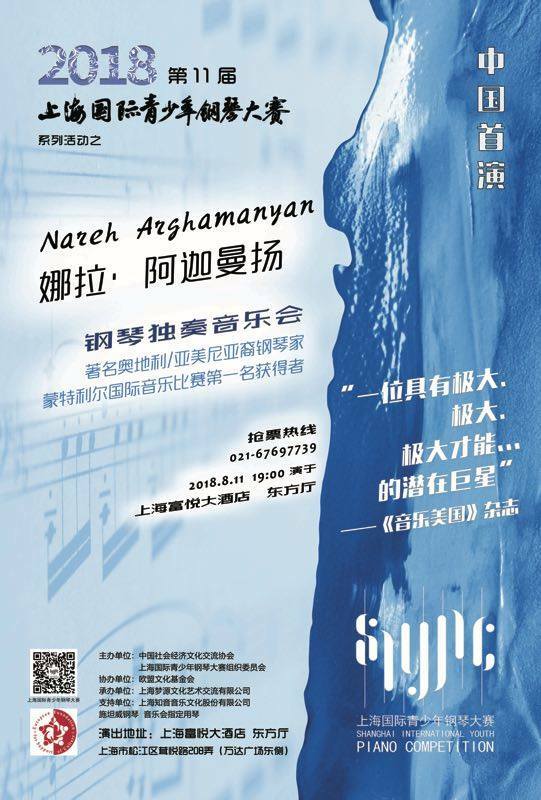 The jury consisted of famous people of the music world, such as composer Chu Wanghua (China), professor of the Eastman School of Music Barry Snyder (USA), professor of the Michigan State University College of Music Deborah Moriarty (USA), professor of the School of Music in New York Jeffrey Cohen (USA), Nareh Arghamanyan (Austria), and others. The repertoire for festival participants included compositions by Brahms, Schumann, Beethoven, Strauss, Mendelssohn, Tchaikovsky, Rachmaninoff and modern Maltese composers. The festival events took place at the most famous Shanghai concert halls: the Shanghai Grand Theater and the Shanghai Music Hall.